Constructed of high density polymer, this versatile drop leg platform is designed to hold four of the CQC accessory carriers for lights, magazines, etc. 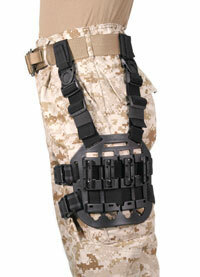 STRIKE/MOLLE compatible to work with a number of BlackHawk STRIKE pouches. The new ''Y'' configuration hanger system adds maximum comfort and flexibility.